This page details some of the pervious shacks and antennas I have used over the past few years. Once I find a layout that works, I tend to stick with it until something (may be a change in a particular area of interest, or perhaps new equipment arriving) requires that I change it. The last major change occurred last year (2013) when I moved to my present QTH. This actually meant a downsize in available room for the radio gear, so I was forced to reassess my requirements and remove some of the underused gear. The result can be seen on the main shack page. 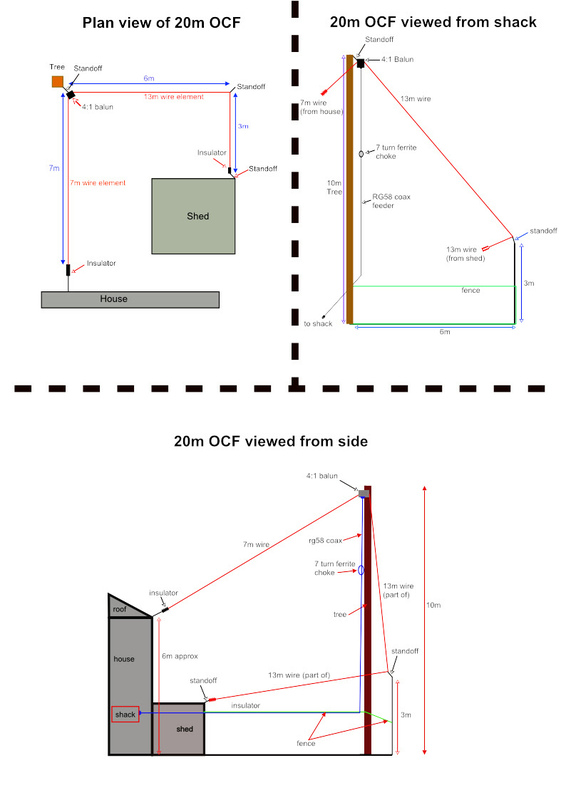 Also on this page are my previous antenna layouts and details, which I have included as they may be of some use to others who want to utilize whatever space they have available, particularly those who want to get on HF but only have a small garden. Below are shots of my previous layout, from just over a year ago. The equipment is still arranged in basically the same way as it was but I have made a few tweaks to aid operating comfort and allow me to accommodate expanding interests (VHF for instance) without taking up any further space. I am fortunate enough to be able to have a large desk to house my gear on, but making the best of your available space takes some planning. 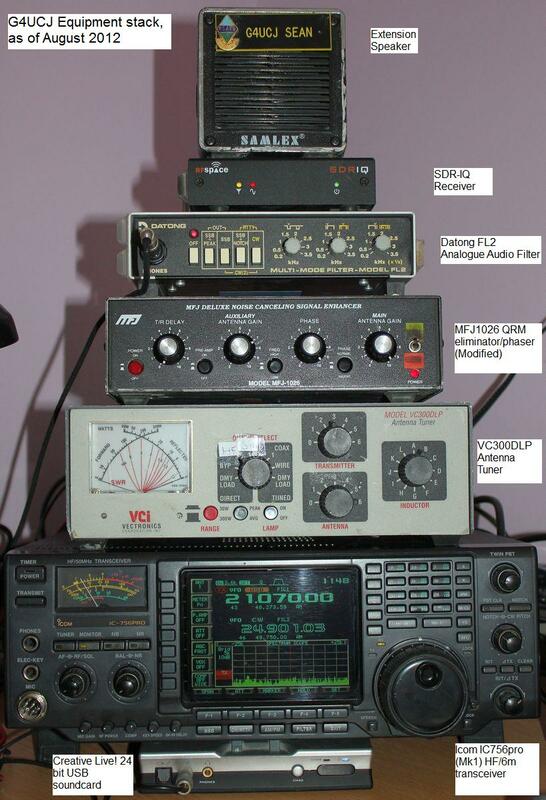 Look on the internet for shack layouts and you will see all sorts, from the tiniest and simplest, to the truly magnificent multi operator/room setups. The main antenna now is a wire dipole for 15 and 10m mounted in my attic, due to a move of QTH. My old antenna was a 20m long OCF (Off Centre Fed) Dipole in an inverted Vee/L configuration due to the length restriction of the garden. The apex of the OCF is 10m above ground. I purchased this antenna as a ‘short’ OCF that covered from 20m thru 6m. However after a few weeks of use I decided to extend the antenna so that it would cover 40m (having done some careful calculations to ensure it would fit in the available space. This antenna was originally 10.5m long but I replaced the shorter, 3.5m, wire with a 13m wire. It has a slightly different element length ratio than the smaller one (which was 3:1). The longer element is now sloping at about 45 degrees instead of a much shallower slope, which could only be achieved by lengthening the support pole at the fence post from 3m to 5m or more, which at this time is impractical. Above are various shots of the OCF/Windom configuration. The drawing gives more detail of the actual installation. The SWR on 40, 20, 17 and 10m are all 2:1 or below, which is acceptable. 30 and 15m are extremely high and 12m is around 3-4:1. Now that I have an ATU, I can tune all bands, and show a good SWR to the radio (and hence keep the PA stresses due to impedance mismatch to a minimum). I installed a dedicated 6m antenna in preparation for the Sporadic E season, which has been in progress for a few weeks now. I used my Windom last year and it worked well and allowed me to hear signals from the Caribbean and North America amongst others. I am not in a situation where I can put up a yagi for 6m but a sloping wire dipole is just about acceptable (I hope!). The top is at about 9m and the bottom is about 7m up and it is in the clear. It is facing about East, maybe slightly north of East, and should have some directionality towards that direction (of course it does mean I potentially lose out to the West (i.e. USA) but it shouldn’t be too bad. Reception tests on the local beacons show an increase of about 3 s -points on the nearer one and on the farther one, which is almost due West of here, there is not much between them. I think the dipole is slightly stronger but, and this is a big but, the dipole has a lower noise level so signals at the same strength sound quite a bit clearer/stronger. It will be interesting to compare the two side by side during the Es season. Below is an image of the 6m sloping dipole. The right angled wire above is the HF OCF dipole, detailed above. The air core choke is further down the feeder than I wanted (it should be at the feedpoint, but it is so far down that it is not visible in the image), but I had wound it already and I wanted to test the antenna. When I service/adjust the antennas I will move the choke up to the feedpoint. It is a simple 4 turn choke about 3” in diameter, wound over a plastic drinks beaker (which was then removed after the choke was secured. It is important that the choke is ‘solenoid’ wound (the turns are side-by-side) rather than ‘scramble’ wound where the coax is just coiled up with turns overlapping. The solenoid method of winding, although trickier to do increases the impedance of the choke, which is the whole purpose of the choke in the first place (any signals on the outer braid of the coax are literally choked off and cannot travel any further down the feeder). This method also minimizes inter-turn coupling. Having experimented with an attic dipole, I decided that a better antenna was in order so that I could use my SDR properly. To this end I purchased a 9:1 unun (unbalanced to unbalanced transformer) and ran a 10m (approx) length from about 2m inside the attic to outside and to the far end of the garden (about 8m further). The antenna works reasonably well, particularly on the bands above 14MHz. However being partially indoors, it does pick up a fair bit of noise. Which is when I decided it would be better served as the noise pickup for my main station, thereby leaving teh Wellbrook loop free for use on the SDR-IQ. If our TV is off though, the noise level is generally acceptable and it is certainly better than the attic dipole. Of course the main antenna is quieter, as the feedpoint is as far from the house as possible.It is important to have as much choice as possible when it comes to antennas - even a ‘make do’ antenna (like my attic dipole) can produce surprises, and just sometimes you might be able to hear something on a second antenna that is not audible on your main antenna (it could have a null in the direction of the station you are trying for or may not pick up an interfering signal as strongly for instance). Also, antennas quite often work on bands they are not designed for, just experiment, it’s fun and you learn an awful lot about what works and what doesn’t! The VHF antenna has been replaced - I was using a 5 element vertical yagi, which was great, but limited to band 2 frequencies. I decided to purchase a triband vertical white stick. I used to have a dual bander which worked pretty well, so the natural progression was to get one that covered 50, 144 and 430MHz. I mounted this in the attic and removed the yagi, because of space and interactivity issues. Pleased to say the vertical works well on most frequencies and I am able to hear plenty of stations. I recently updated my main computer from a laptop to a base unit so that it was capable of running the latest SDR sofware packages, that take advantage of increased RAM and CPU power. It is specced as follows: Quad Core i5 processor running at 3GHz with 16GB RAM, 1GB graphics card, SoundBlaster Audigy ZS2 soundcard, and a 1TB hard drive with 23” and 21.5” HD monitors. So far it is proving to be a very fast and powerful PC and makes using the SDR a pleasure.